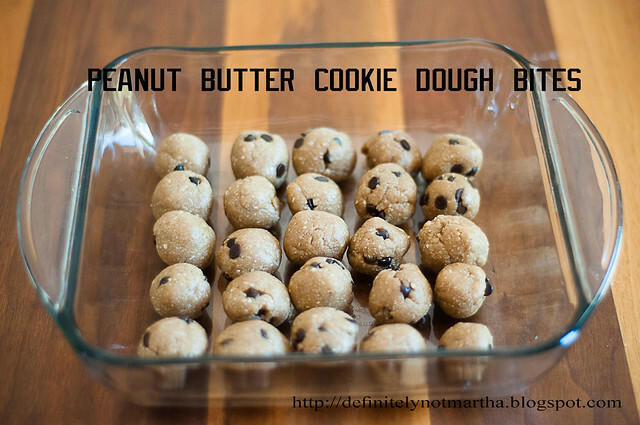 Ever since I discovered these chocolate chip cookie dough bites, I have been hooked on the concept. 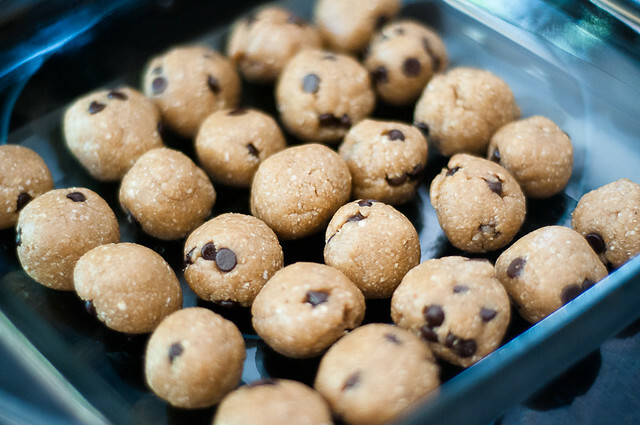 These things are so simple to make (essentially, drop everything in a food processor, combine, mix in some chocolate chips, then roll), and they are incredibly delicious. And when you look at the ingredient list, you can actually feel pretty good about enjoying a ball or two with your afternoon coffee - the perfect little pick-me-up to get you through to dinner. This recipe is not my own (though I did change the method a bit due to my laziness) - it actually comes from the Oh She Glows cookbook, which is a fantastic book from one of my favourite bloggers. I am normally hesitant to add to my already too-extensive cookbook collection (especially when the internet is rife with recipes), but I received this one as a birthday gift. And I have to say, it's an awesome addition that deserves every to be on every shelf. I've tried quite a few recipes (tex-mex casserole and glo bars) and they have all been fantastic. These cookie dough bites were a HUGE hit with my mini-foodies and with me too. Delicious flavour and a wonderful treat to have with an afternoon coffee. 1. 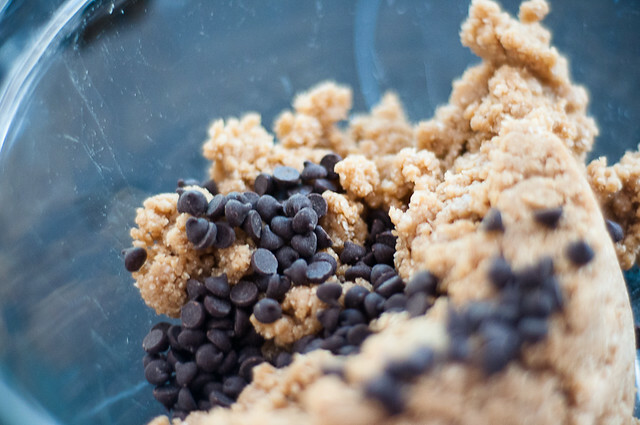 Blend the oats in a food processor until they have a flour-like consistency. 2. Add the coconut oil, peanut butter, maple syrup, vanilla, almond meal and salt, and process until the mixture is combined (you don't have to go crazy to make it perfect - just get it to combine. 3. 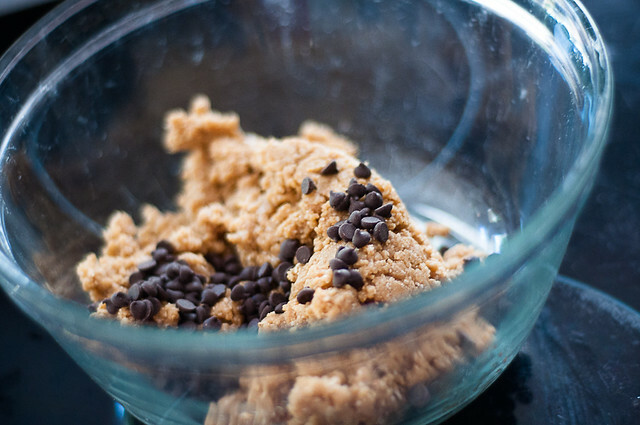 Scrape the batter out of the food processor and into a bowl, then add the chocolate chips. Fold them in to combine. 4. Roll into balls (I made mine smaller and it made about 25). Freeze bites for 5-10 minutes (until firm) and store in the fridge. You can store in the freezer, but they are a bit hard to eat.